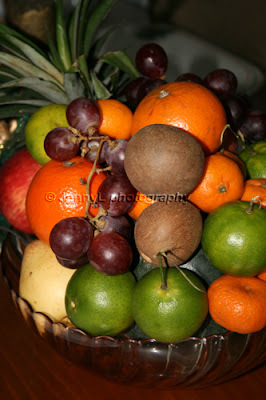 We always see to it that each year we will leave fruits in our table for bountiful blessings the coming year. My sis and I went to market yesterday morning of the 31st to buy different fruits that i will put in a bowl. There were lots of people already when we got there and OMG the prices of the fruits had gone up big time! Imagine, a small watermelon and unripe melon costs about P50, helllllloooooo! (ano yon ginto? hehehe), vendors are taking advantage of people bec. they know know many will buy fruits. I didn't buy any melon but i bought a watermelon for only P35. I got one small pineapple for P15, grapes, chico, ponkan, orange, guava, dalandan, pear, apple, watermelon, and kiat kiat. They say you have to complete 13 different kinds of fruits but i only got 11 kinds. Oh well, as long as I have fruits on the table, i guess that will do it.